Bgo.com are dishing out the spins again this week. Each day until Sunday 26th August 2018 players simply need to log in and play Jumanji between 7pm – 10pm BST. 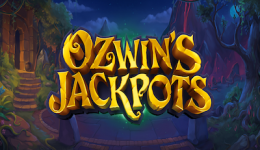 Any participating player can go on to win an instant Free Spins prize, with no wagering requirements! This promotion is available to all accepted at bgo player countries, and both new and existing players are invited to participate. A maximum of 10 free spins will be awarded per day. Any wins from the free spins drop are paid out as cash and have no wagering terms. However, other terms apply: These include that you may withdraw your cash balance at any time without restriction, except where necessary to comply with any general regulatory obligations. Bgo.com also reserves the right to charge a fee of £2.50 for all withdrawals of funds. Jumanji is a relatively new game to Bgo.com and other casinos. We recently reviewed the game and enjoy the graphics but found the maximum win on offer a bit disappointing. 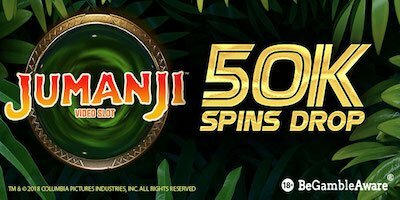 If you’ve not tried Jumanji yet then this free spins drop promotion is a good incentive to give it a try. Whilst visiting Bgo.com you might also like to try some of their other recent additions! Tiger Claw: Boasting 4,096 ways to win, this superb video slot harnesses the power of a ferocious big cat. The 6 reels are set before an immense oriental wilderness and feature a variety of wild beasts. Keep your eyes peeled for the legendary White Tiger, which can stack up on all reels for mighty pay-outs! 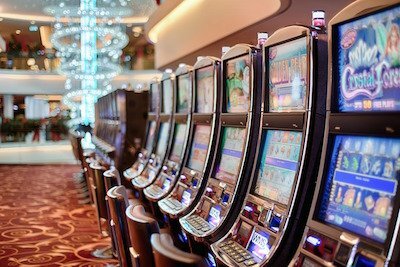 You’ll also have the chance to you sink your claws into one of the most phenomenal Free Spins Bonus Features. It begins with up to 100 Free Spins and provides opportunity to trigger more Free Spins indefinitely throughout! Hidden Valley: On their journey through Tibet, a group of lucky travellers have discovered the secret entrance to Shangri-La. 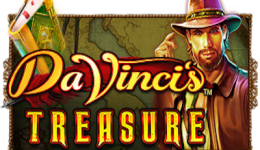 Join them in this stunning online casino slot, as they step inside the mythical valley of peace and tranquillity to search for treasure and enlightenment! As well as 40 paylines and an impressive 96.47% RTP, the game boasts multiple bonus features. On the gate into the valley you’ll discover a Bonus Wheel giving you the chance to win Free Spins and Extra Wild Symbols. Whilst inside you could be greeted with Multipliers and Stacked Wilds! Wonder Woman: It’s time to join forces with Wonder Woman! This superb 5-reel, 40-payline video slot is inspired by the famous female super hero from the DC Universe. It boasts a variety of action-packed bonus features to help send your pay-outs soaring. Fight for good in Knock Out Wilds Free Games, during which the reels grow 8 rows high and Wilds lock in place to work wonders throughout all Free Spins! Or brave the U Spin Wheel for the chance to land an instant cash prize of 10x your bet or even 1 of 3 progressive jackpots! Wagering terms and conditions apply. All details above were correct when published on August 21, 2018.